Monjasa consolidates its physical operations in North Western Europe and in particular in the world’s second busiest waterway, the English Channel. Over the past year, Monjasa has established exclusive oil terminal operations and bunkering facilities in Portland Port, Tongue Anchorage, and set up an office in London. Extended bunkering operations at Tongue Anchorage further tightens the Monjasa Group’s European physical supply operations, which stretch from the Baltic Sea to the English Channel. This announcement comes only 14 days after Monjasa announced a new credit facility of USD 80 million, and it fits well into the Group’s extended focus on the UK. Over the past year, Monjasa has thereby established exclusive oil terminal operations and bunkering facilities in Portland Port, Tongue Anchorage, and opened office premises in London. Following positive talks with the Thames Fishermens’ Association, and in association with Portland Bunkers (PBUK), Monjasa recently reached an exclusive agreement that satisfies all requirements by the Port of London for the local oil spill response plans. This will provide overall direction for the management of the counter-pollution response service. 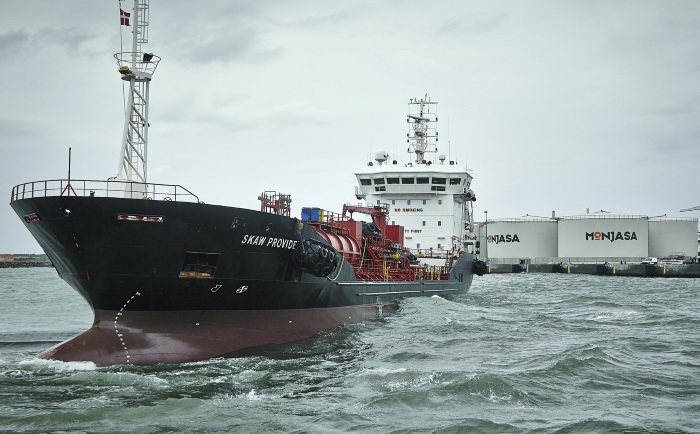 With the help of PBUK, and this agreement in place, Monjasa now offers operations at Tongue Anchorage and provides customers with marine fuel oil (IFO) and marine gas oil (MGO). Naturally, with all products meeting the latest ISO 8217:2010 specifications. “It’s part of the Monjasa Group strategy to consolidate and strengthen our physical capabilities across North Western Europe. With this extended set-up in the English Channel, we are underlining our capability of offering supply security throughout the region, matching our customers’ needs. Furthermore, we are exploiting further synergies with our existing physical set-ups in Portland Port, UK, the Port of Skagen, Denmark, and in Riga, Latvia. The aim is to benefit our customers, by offering flexibility on a string of supply locations,” explains Ricky Kenbjerg, Managing Director for Monjasa Europe. Tongue Anchorage is conveniently located close to the main London freight routes. This strategic location enables Monjasa to serve both south and northbound vessels with very limited deviation time as a result. Furthermore, Tongue Anchorage will be available for bunkering on a 24/7 basis, and thanks to the safe and easy access to the anchorage, customers are not obliged to take pilotage to get refuelled.